Search.readysteadyfly.com is the PUP that uses misleading techniques to prevent removal. Use Reimage to locate malicious components and get rid of them faster than with uninstall instructions. A full system scan blocks virus reappearance and prevents traffic to malicious domains. Readysteadyfly.com is a questionable browser hijacker that changes your default homepage and search settings in a specific way. Infected web browsers will load Ready Steady Fly website by default and ask you to use its search engine daily. Unfortunately, experts warn that doing so can put your security and privacy at risk. 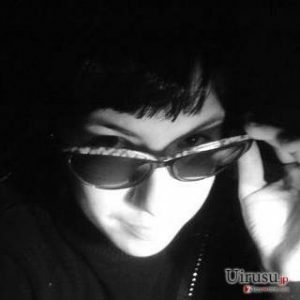 Search.Readysteadyfly.com virus aims to infiltrate the computer system to make alterations in browser settings. Doing so allows it to track victim’s searching and browsing activities as well as collect personally non-identifiable data. We may share Non-Personal Information with our trusted Service Providers only to the extent required to fulfill the purposes of providing the services. Trusting search results brought by this vague searching tool would be naive and dangerous, as it tends to clutter them with sponsored links. All search queries are sent to feed.readysteadyfly.com which then redirects victims to an ad-filled Yahoo Search results page. The origins of links behind those ads can be shady and clicking them might land you on malicious, deceptive or merely useless websites. We do not claim that all of them are exceptionally dangerous – it is simply better to stay vigilant when exploring them. However, since this hijacker tends to replace browser’s settings without user’s knowledge, we do not recommend keeping it on the system any longer. If you want to rely on the search engine, better choose a better one than the one we described. In fact, it is even better to remove Search.Readysteadyfly.com from the browser in order to get access to browser’s settings. 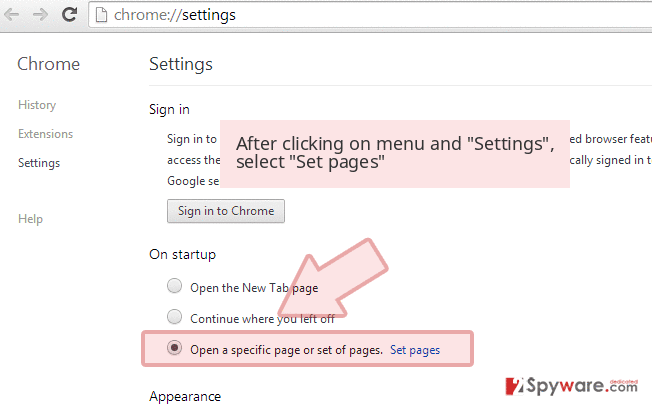 Keeping this potentially unwanted program (PUP) can severely impact your possibilities regarding configuration of browser settings, therefore it is a must to get rid of the virtual pest before attempting to change your homepage and default search in Chrome, Firefox, and other major web browsers. For Search.Readysteadyfly.com removal, we usually advise using Reimage, although Malwarebytes MalwarebytesCombo Cleaner is worth mentioning as well. 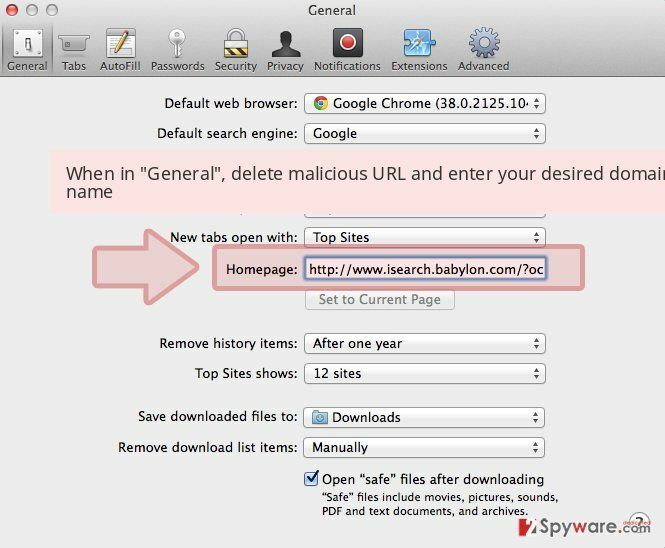 Search.readysteadyfly.com browser hijacker wants to change your browsing preferences, so it alters homepage and search settings in Chrome, Firefox, and other major browsers. Later on, it starts delivering annoying advertisements. Looking for a new free program? Then you should beware of programs that try to sneak potentially unwanted programs into your system without your knowledge. Browser hijackers, adware, and rogue system tools tend to travel alongside popular freeware and therefore can be installed if the victim decides to rely on Standard, Default, or Basic installation options. Exclude these options from your preferences and always rely on Custom or Advanced installation instead. Another tip to follow is to deselect any additional applications bundled with your download. Forget the idea of “trying new and cool programs” as these are most likely to be ad-supported virtual annoyances. You do not need those in your life. Finally, watch what web pages you visit. Avoid visiting questionable websites that clearly monetize their content by pushing dangerous sponsored content and products (such as spyware-type programs) to visitors. To clean your computer and remove Search.Readysteadyfly.com virus, you must read instructions provided by the 2-Spyware team. Please do not rush and read every provided step – the instructions explain how to fix various things, not only how to uninstall programs via Control Panel. Novirus experts say that the majority of users hop over important removal instructions because they believe they just explain the Control Panel part. Also, you can professionally check your computer system for threats using an anti-spyware or anti-malware program. Most of these programs offer a free scan feature, which helps to identify spyware and malware on the computer. Also, they can complete Search.Readysteadyfly.com removal in seconds. Here, look for Search.readysteadyfly.com or any other recently installed suspicious programs. Wait until you see Applications folder and look for Search.readysteadyfly.com or any other suspicious programs on it. Now right click on every of such entries and select Move to Trash. When in the new window, check Delete personal settings and select Reset again to complete Search.readysteadyfly.com removal. 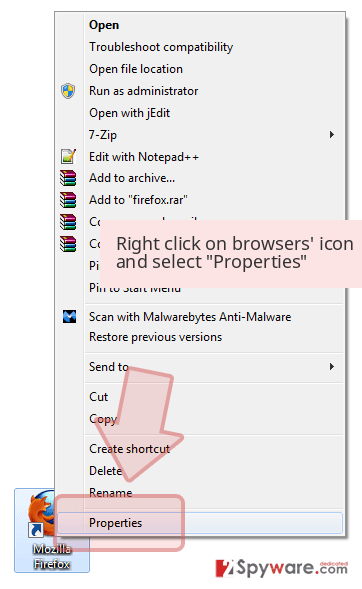 Once these steps are finished, Search.readysteadyfly.com should be removed from your Microsoft Edge browser. Fix Firefox and avoid the need to use Readysteadyfly.com search by completing the given list of tasks. Here, select Search.readysteadyfly.com and other questionable plugins. Click Remove to delete these entries. Now you will see Reset Firefox to its default state message with Reset Firefox button. 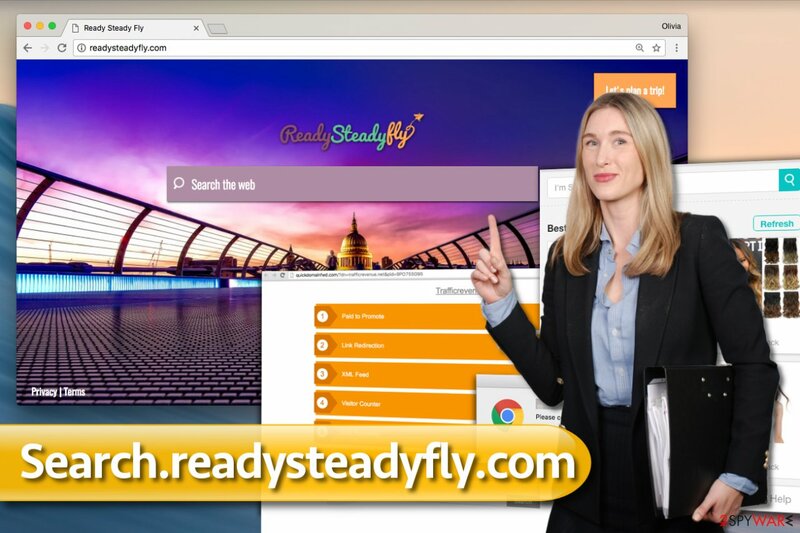 Click this button for several times and complete Search.readysteadyfly.com removal. 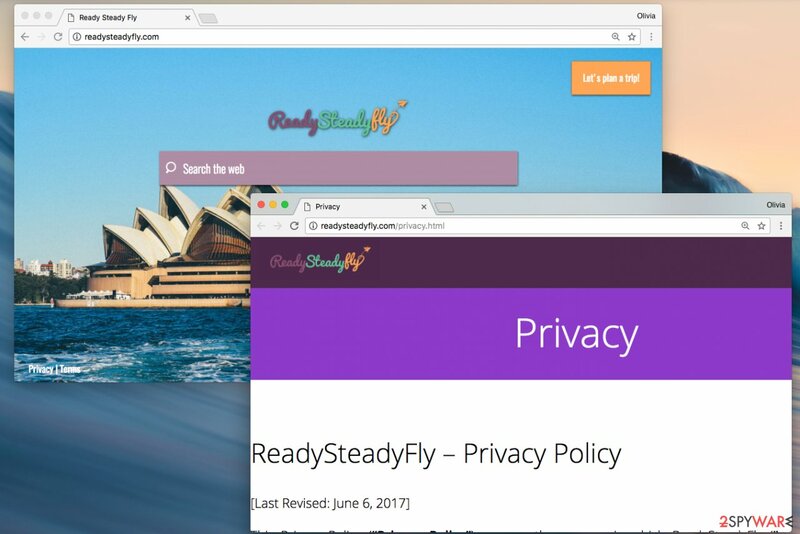 Find ReadySteadyFly extension in Chrome and uninstall it in accordance with instructions listed below the article. Here, select Search.readysteadyfly.com and other malicious plugins and select trash icon to delete these entries. 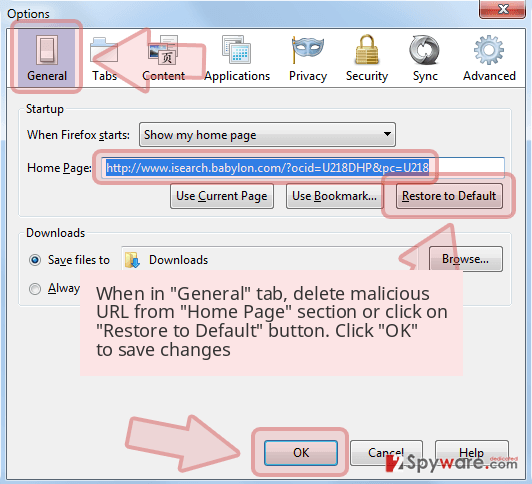 Click Reset to confirm this action and complete Search.readysteadyfly.com removal. 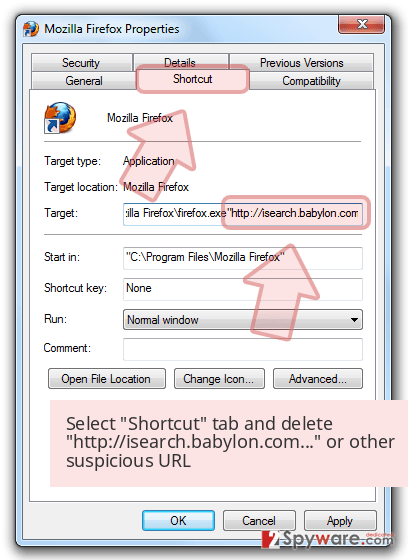 Here, select Extensions and look for Search.readysteadyfly.com or other suspicious entries. Click on the Uninstall button to get rid each of them. Here, look at the Homepage field. If it was altered by Search.readysteadyfly.com, remove unwanted link and enter the one that you want to use for your searches. Remember to include the "http://" before typing in the address of the page. Now you will see a detailed dialog window filled with reset options. All of those options are usually checked, but you can specify which of them you want to reset. Click the Reset button to complete Search.readysteadyfly.com removal process. ^ The most dangerous browser hijackers of February. VirusActivity. Malware, Spyware News and Security Advice. ^ NoVirus. NoVirus. Malware Removal Guidelines. This entry was posted on 2017-10-20 at 01:55 and is filed under Stealing programs, Viruses. You can quickly scan the QR code with your mobile device and have Search.readysteadyfly.com virus manual removal instructions right in your pocket. How did you remove Search.readysteadyfly.com virus?